Take a look at this brilliant video on How Does Sugar Affect The Brain. What makes sugary food so hard to resist? What happens in our brains? Watch and see how sugar works on your dopamine reward system. What happens when sugar hits your tongue? Does eating a little, make you want to eat more? Why do we never get bored of that sweet taste and actually crave sugar? Dopamine (and hence reward) levels drop off when you eat the same food again and again which is why the same meal over and over can become boring. Your brain has evolved to encourage you to try new things and eat a variety of foods to ensure you are getting all the nutrients it needs. But sugar, well it just makes you want more. Dopamine levels don’t drop off and so eating sugar continues to feel rewarding. If you feel like you just can’t stop and you want more sugar, its because it is in everyday foods now (sauces, yoghurt, dried fruit, muesli/granola bars) so is incredibly hard to give up. 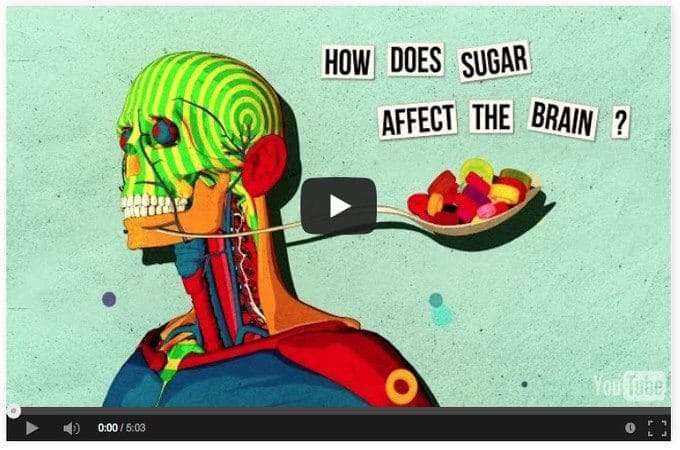 Source: Ted Ed How Does Sugar Affect The Brain. Libby. Thanks for quick responses to queries. My son and I are both loving your recipes and from someone who can’t cook very well, it’s definitely improving so another bonus! We’re hitting -2 degrees here in good old London so cauliflower bake definitely going down a treat. 4 lbs lost since 01 Jan and I’m eating loads! One thing I would like to ask. Would love to explore more LCHF recipes – are you are able to recommend any other cookery books? Ideally British – purely because easier on ingredients, measurements etc. Will not stop using your site though so don’t worry! Have looked on amazon and reviews can be confusing but your opinion would be appreciated? I would love to write one and are asked almost weekly, I just need a publisher and a nanny 😉 Take a look at Real Meal Revolution which is amazing. It is one of the best selling books in South Africa where LCHF is known as Banting (after William Banting) and has an incredible following. I would agree. I have Real Meal Revolution. It is excellent.